Mid July of 1995 I received a phone call from our daughter, Kim who was living in Detroit at the time. She had been given four birds and needed to find homes for them. Which meant “can we keep them”. That Sunday my husband Ralph and I made the journey to pick up our new family members, and that was the beginning of my love for a plain little green bird. 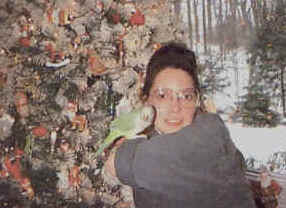 Casper, a Quaker parrot was almost three when he came into our lives. He liked me immediately, but it took awhile for him to warm up to the others. On the way home he started speaking from the back seat. For the next four years he took residence between the kitchen and dinning room were he ruled our home. Soon we found those few words were just a beginning. He sang three different songs, danced, acted as our watch dog telling us when ever anything was outside, tattled on anyone snacking late at night and in general worked his way into all of our hearts. During this time he became Ralph’s buddy Casper would tell Ralph when he needed to go to bed at night by calling “Daddy” until Ralph picked him up pet him until he purred, said good night and placed him on the bottom of the cage in his favorite corner. Casper would greet us each morning by saying good morning three times, once for each person. When he didn’t like something you were either told to shut up or to go lay down. About six months ago he was diagnosed with fatty liver disease and were told to reduce his fat intake. Easier said then done when every other word out of his mouth was “want some”, “oh it’s gonna taste good” or “can I have some”, but we tried. Super bowl Sunday Casper stopped talking and eating we knew something was wrong. We rushed him to the closet emergency care center, which was an hour away. They flushed his crop out several times thinking that he might have had a blockage. We took him home that night and scheduled a appointment for x-rays on the following Wed. just to make sure that nothing had gone into his lungs when the treatment was done. He seemed better that night, but the following morning we found him by his water dish taking a small sip of water and then regurgitating. When my husband went to work Casper, who hadn’t spoken in two days told him “Goodbye” his last words. Again we rushed Casper to the nearest avian vet this time hour and a half away. Ralph couldn’t join us because of work. The Vet wanted us to leave him to run some tests. Two hours later he was gone. Although we have four other birds in our home there is a huge hole left in our hearts. Missing the 9,000 questions and comments that came from that corner of the room each day. We couldn’t even look at that part of the room. Who would have thought such a plain little green bird (that my daughter nicknamed the Raptor) would have made such a difference in our lives. He is resting in my flower garden outside the kitchen window. The days seem to be much longer and quieter without him. This was written to let others know what a wonderful friend and loved one we had. Casper, we will always love you and remember. And in the tree's a hollow spot just to throw me away? would play and swim and meet. to see what lurked around. Oh how I want them back. I had to watch him die. our place where we would rest. it hurt to hear them scream. is all that there would be. no longer would he wail. our home is falling down. no calls for me to hear. and never will be three. and ranchers with their cows. Dear mate it won't be long. Knowing, you did all that you could do. Copyright © 1996 Terri L. Doe All rights reserved.